LOS ANGELES – Adrien Broner wasn’t trying to excuse away anything. Broner, a former champion in four weight classes, realizes he has gone 0-2-1 in his past three fights. His recent record and overall record would be better, Broner contends, if he were more selective about who he boxes. In his past three fights, he has lost a pair of 12-round unanimous decisions to Mikey Garcia and Manny Pacquiao and settled for a 12-round majority draw with Jessie Vargas between those two bouts. 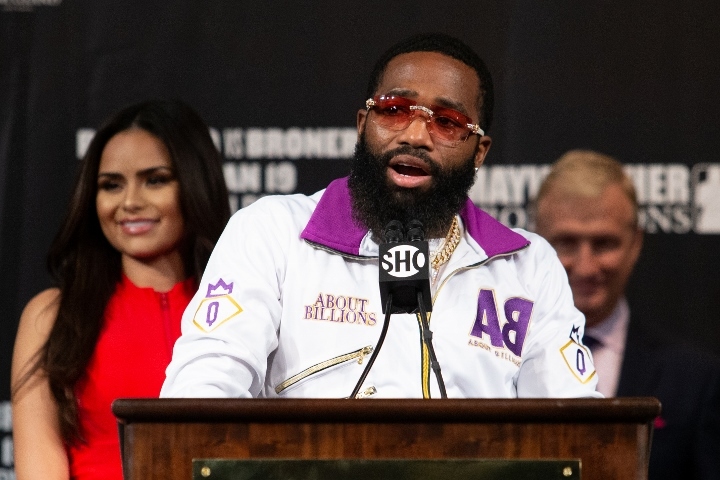 Broner discussed his willingness to fight anyone with a group of reporters over the weekend, while he was in town to support his friend, Gervonta Davis, who knocked out Mexican veteran Hugo Ruiz on Saturday night in Carson, California. The 29-year-old Broner (33-4-1, 24 KOs 1 NC) most recently suffered a lopsided points loss to the 40-year-old Pacquiao (61-7-2 39 KOs) on January 19 at MGM Grand Garden Arena in Las Vegas. The Cincinnati native doesn’t regret his choices of opponents, even though he hasn’t won a fight since he narrowly won a split decision against Adrian Granados (20-6-2, 14 KOs) nearly two years ago. Broner expects to make a relatively quick return to the ring because he didn’t consider the Pacquiao fight particularly taxing. Pacquiao buzzed Broner in the seventh and ninth rounds, and the Filipino icon won convincingly on all three scorecards (117-111, 116-112, 116-112). Speculation persists regarding a potential Keith Thurman-Broner bout for Thurman’s WBA welterweight title. Broner also feels like he could move back down to 140 pounds for the right fight.